Chemical interactions in aqueous systems make up an important area of environmental chemistry, and the properties of water determine the behavior observed in solution. The water molecule is angular and, owing to the large difference in electronegativity of oxygen and hydrogen, quite polar. Consequently, water molecules will have strong electrostatic interactions with one another, and with dissolved ionic materials or other highly polar molecules. Because the electronegativity of oxygen is large enough that the bonding electrons have little effect in screening the hydrogen nucleus from interaction with centers of negative charge on other molecules, hydrogen bonding of water to molecules with highly electronegative atoms is important. The energy of typical hydrogen bond interactions is significantly larger than that of ordinary dipole-dipole interactions of polar molecules, although much weaker than most covalent bonds (Table 9-1). Hydrogen bond interactions, to a first approximation, may be regarded as a special case of an unusually strong dipole-dipole attraction. This leads to molecular association, may determine details of molecular structure, and in appropriate cases produces stronger hydration of dissolved species than would have been the case based on a simple dipole-dipole interaction. Hydrogen bonding is of greatest importance in aqueous solutions of molecules with oxygen and nitrogen groups, and particularly with OH or NH groups that not only are hydrogen-bonded by the hydrogen atoms of the water molecules but can themselves hydrogen-bond to the water oxygen. FIGURE 9-2 Hydrogen bonding between two water molecules of ice. The longer, thin lines represent the hydrogen bonds. warming, increased hydrogen bond breaking allows the packing efficiency to increase, while greater thermal motion acts to reduce the density. The interplay of these counteracting tendencies results in the variation of density illustrated in Figure 9-3. The maximum density occurs at 4°C. FIGURE 9-3 Variation of the density of water with temperature. but the density gradients in the liquid are also responsible for stratification effects of considerable importance. Figure 9-4 illustrates stratification in a typical deep lake. In summer, the upper level, the epilimnion, consists of comparatively warm water. Photosynthesis takes place in this region, and the oxygen content is likely to be high. The thermocline represents a region of rapid temperature change. The lower level, the hypolimnion, consists of colder water. Although oxygen is more soluble in cold than in warm water, the only source of oxygen here is diffusion from higher levels. Since oxygen is used up by decomposing organic matter that has settled to the bottom, the oxygen content of the hypolimnion is likely to be low and reducing conditions may exist. A typical lake of this sort will "turn over" in the fall, and often again in the spring, but otherwise there will be little mixing. "Turnover" refers to displacement of the bottom water by surface water as the latter reaches the temperature of maximum density. Nutrients taken up by organisms in the epilimnion are largely released when the organisms decay in the hypolimnion. Thus this "turn-over" is important for biological productivity, because it brings nutrients back to the levels at which photosynthesis takes place. FIGURE 9-4 Schematic representation of stratification in a deep lake. lake. The sequence of events can be speeded up artificially by introduction of nutrients to enhance algal growth. The term "eutrophication" is commonly used to describe this process. The ocean is an example of an environmentally important system that contains a large amount of dissolved salts that increases the density of seawater compared with that of fresh-water; the density is greater the higher the salinity. Salinity is expressed as grams of salt per thousand milliliters; a typical ocean value is 35%o (3.5%). The salt content affects other properties of water—for example, the freezing point is decreased. Water of 35V salinity freezes at — 1.9 °C. Since the ice produced is pure water (except for such brine as may be trapped in inclusions), the salinity of the unfrozen water increases. The variation of density with temperature also differs from that of freshwater; there is no maximum density before the freezing point but a continuing density increase until the freezing point is reached. FIGURE 9-5 Surface ocean currents (greatly simplified). 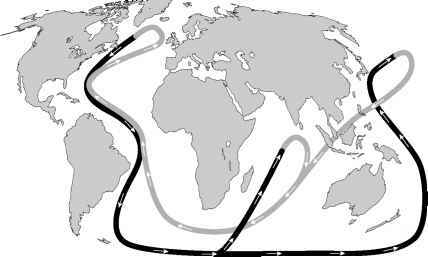 FIGURE 9-6 Thermohaline circulation and the "global conveyor belt." From TOPEX/Poseidon project office at the Jet Propulsion Laboratory, Pasadena, California. http://geosuml.sjsu. edu/~dreed/ 130/labl0/30.html. waters, which are rich in nutrients, return to the surface. Areas of extensive upwelling are important for marine life. Besides the North Atlantic Gulf stream, similar equator-to-pole surface flows exist in all the earth's major oceans, producing clockwise surface circulation in the Northern Hemisphere and counterclockwise circulation in the Southern. (See the discusion of Coriolis effect in Section 2.6.) While the surface currents are largely wind driven, the return deep-water flows are driven by density differences that arise from differences in salinity and temperature and are called thermohaline circulation. Together, the surface and deep currents are referred to as a "global conveyor belt,'' carrying heat from the tropics to the polar regions. These flows have an important influence on climate, keeping the climate of northern Europe milder than that of eastern North America at the same latitude, for instance. The relationship between global climate and these circulation patterns is clearly important, although not fully understood. One proposal suggests that increased global warming could lead to additional polar ice melt that could result in overrunning of the saline water by a layer of lighter, low-salinity water, causing the original flow pattern to be disrupted and further changing the climate. Recent studies suggest that shutdown of present ocean circulation by global warming could perversely cause European temperatures to drop several degrees2 and that severe short-term temperature swings could result. There is evidence that this has occurred in the past. It is complexities such as these that make prediction of the effects of an increase in global average temperature difficult. Besides the unusual density properties that water exhibits as a consequence of its hydrogen-bonding interactions, water also has high values for several thermodynamic properties (e.g., specific heat and enthalpy of vaporization) that are important factors in climate. Specific heat refers to the amount of heat energy required to change the temperature of a unit amount of substance by one degree. Its value for water is 4.184 J g_1 (it varies slightly with temperature) compared to about 0.22 J g_1 °C_1 for air at constant pressure. Consequently, passage of cool air across a body of warmer water can noticeably warm the air with only a small change in water temperature. Ocean currents can convey large amounts of energy, which is why they are so important to climate. The heat of vaporization of water—that is, the energy required to convert the liquid to the vapor, or the energy released in the reverse process—is 2.266 kJ/g. This energy will be absorbed from a body of water through evaporation, with consequent cooling of the water. It is also released to the air when water vapor condenses, thus warming the air, and is the energy source for cyclonic storms. The heat of fusion of water—that is, the energy required to melt ice, or that released when the liquid freezes—is 0.334 kJ/g, not a particularly large value in comparison to other liquids, since many of the hydrogen bond interactions responsible for interactions in the solid remain in the liquid. Variation of density with temperature means that the ocean volume, and consequently the sea level, will change with temperature. Warming will cause expansion, although this is a small effect, especially if warming were limited to the surface layer. Melting of floating sea ice (e.g., the Arctic Ocean, where major decreases in ice thickness have been noted in recent years) would not in itself have much effect either, because floating ice displaces a volume of water equal to its mass. (This is not to say that low-lying regions would not be impacted by relatively small changes.) The unlikely melting of land-based ice (e.g., much of the Antarctic, and to a lesser degree the Greenland ice caps) would be much more significant, as this would add more water to the oceans. Sea levels are increasing slowly. 2R. A. Kerr, Warming's unpleasant surprise: Shivering in the greenhouse? Science, 281, 158 (1998). For more technical discussions, see F. Joos, G.-K. Plattner, T. F. Stocker, O. Marchal, and A. Schmittner, Science, 284, 464 (1999); R. A. Wood, A. B. 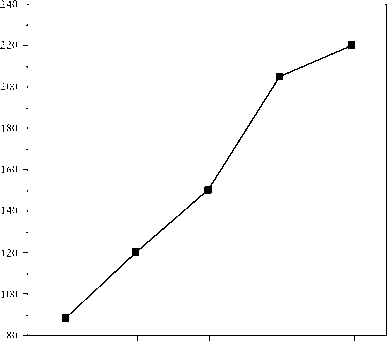 Keen, J. F. B. Mitchell, and J. M. Gregory, Nature, 399, 572 (1999); and W. S. Broecker, Science, 278, 1582 (1997).